In my previous post, “Air Service in Chico – Preserve“, I stressed the importance of retaining the flights we already have to San Francisco. Essential to retaining that service, and with some luck getting United to add frequency to San Francisco, is taking steps to actively promote the existing service. First, three anecdotes that comprise my purely personal experience about the promotion of Chico air service since I moved to Chico in 1998. Now maybe readers can comment back and cite some examples where the airline did advertise its service or contributed travel to a local fundraiser or event, but even so the instances must have been few and far between. The result is air service that is as close to invisible as it can be. If you know about it, great, you’re part of the club. If you don’t, well then you may think that the closest commercial airport is Sacramento. Some readers may laugh, but I have encountered people who didn’t even know you could fly from Chico. I’m not kidding. One of the biggest pools of potential fliers is also the one that is least likely to know that Chico even has an airport: Chico State students (and their parents). If they’re not from the Central Valley or the Bay Area, then they are likely to consider flying home instead of driving or using Amtrak. But they need to be aware that we do have commercial air service here, or they’ll automatically fly from Sacramento. It’s pretty basic but the airport needs a more robust web presence, a Facebook page, and a Twitter account. To be accurate, there is an airport page on the City’s website but it really isn’t set up for promoting the service. FlyChico.com is taken by a squatter, but among the freely available sites are FlyChico.gov, FlyChico.org, FlyChico.net, FlyChico.biz, or FlyCIC.com. Of course these are just basic tools – it’s what we build with them that matters. What follows is a short list from my own musing. It isn’t by any stretch meant to be comprehensive. We need to get clever people in a room to come up with cool approaches to fill these planes. If you have ideas of your own by all means comment back. The ideas that follow all have dependencies, to use business jargon, mostly involving United Airlines/SkyWest or local business, but they should be pretty obvious based on what the idea is. Some are aimed at locally originating traffic from Chico, and some are aimed at externally originating traffic to Chico but most of them could appeal to either group. Because of the City of Chico’s present poor financial state, we must assume that the City has no money at its disposal to contribute to these measures. The emphasis should be on efforts that are free or low-cost, and supported by the local business community. Other than seeking “soft dollar” free tickets from United for promotional purposes, I think it is a safe bet that no cash would be forthcoming from United Airlines or SkyWest Airlines. - Fly Chico Passport – an array of deals offered by local merchants, restaurants, and entertainment venues is published in a passport-like folder. This would require presentation of a boarding pass dated within one week of the date used or perhaps the passport is simply date-stamped by SkyWest or a volunteer greeter at the airport. – Olive oil flies free: allow passengers to check a box of olive oil without paying a checked bag fee. Horizon Air initiated this for one case of wine when they began service to Santa Rosa in ’07 and it has been very successful. They have since extended the policy it to Walla Walla, Wash. Our region is rapidly becoming the Napa/Sonoma of California olive oil – what better way to promote the service to fly-in visitors than by letting them ship a box of olive oil home from the local airport for free. – University: I don’t know what would work best to reach Chico State students. Perhaps the College of Business could have a contest among its marketing students to design an effective low-cost or no-cost Fly Chico campaign to reach their peers. – Chico’s business community: A key to success is getting more business travelers to fly out of Chico. Successfully addressing the reliability issue discussed in earlier posts is a big factor, but there’s more to it than that. Beyond promotions that provide incentives to individual travelers – leisure or business – what else would help to reach businesses with employees who travel for their work? Would these and other promotional efforts be successful? I don’t know, but what I am certain of is that air service at the Chico airport has far too low a profile. I also know that if we put some energy into this that United Airlines and SkyWest will take notice. Will they grant us three wishes for anything we want? No, but it will be clear that we are working hard to keep the existing service to San Francisco and make it thrive. And only if it thrives is there any hope of progress in our next goal: expanding the service. The City of Chico’s Airport Commission is developing its 2013-2014 work plan. At last night’s meeting, I was pleased that the Commission chose to adopt the language I suggested (“Preserve, Promote, and Expand”) for the element about commercial air service. Here is the summary of the “Preserve, Promote and Expand” concept that I sent to the Commission in March, which I think concisely presents the key points. Future posts in this series will add more detail to each of the three goals. We must preserve the service that we have – inadequate as it may be – because it will be very difficult if not impossible to bring air service back to Chico once it is gone. 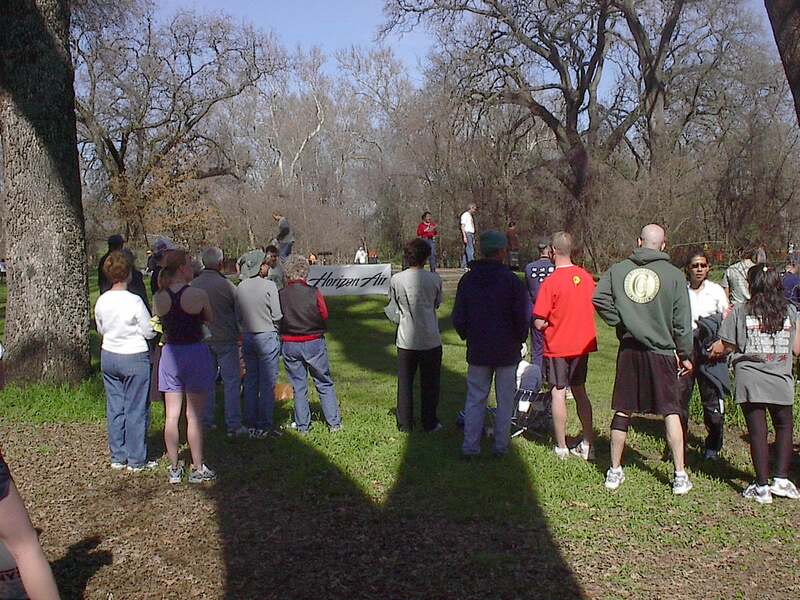 We need to explore all possible avenues to promote the current service both to those who live in the Chico catchment area traveling outbound, and to those who are inbound to Chico from other cities. In order to preserve the current service, we must do everything we can to make it successful. If we do not, then we not only risk losing the service we have, but we will also have much greater difficulty attracting the additional service we would like to have. Success breeds success. We need to distinguish two different but equally important avenues of expanding service. The first is to increase the frequency of flights on United Express between Chico and San Francisco. More flights means more reliability, more reliability means more demand, and more demand means more hope of achieving our second goal. 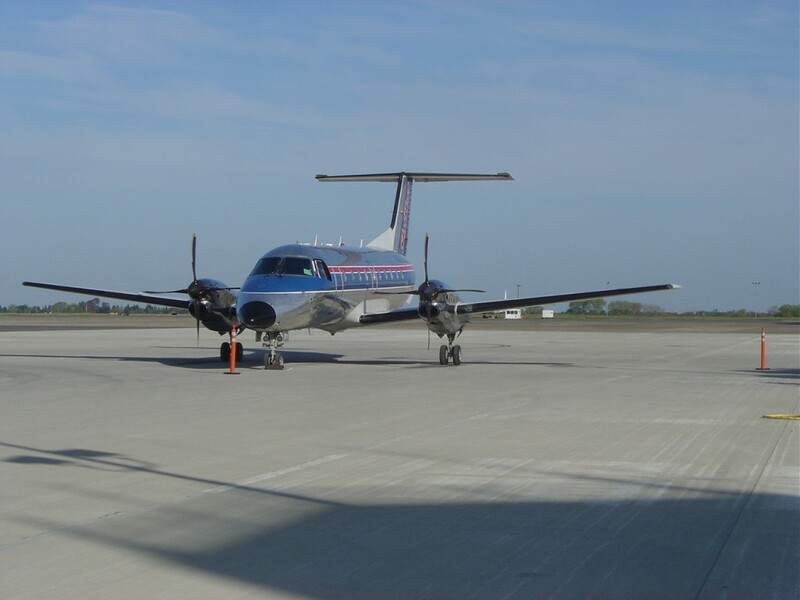 The second is to seek service by United Express or other carriers to new destinations. Los Angeles (LAX) has been cited as the single most important new market, but opportunities to the other western hub airports (Denver, Salt Lake City, Las Vegas, Phoenix) should be pursued with just as much vigor, as well as Portland or Seattle to the north. It is indispensable that we create a coalition of interests – business, political, and community – to work together. It will also require money to pay for the origin-destination data analysis that we (or a consultancy we hire) use to present our case to airline planners. Depending on the size of aircraft, physical and security infrastructure investments at the airport may also be mandatory as a precursor to expansion. Chico’s business community should understand that for there to be any chance of success they must be prepared to commit travel dollars in advance to a fund which guarantees the viability of a new service in its infancy. Above all, it will require patience, perseverance, and ingenuity, and even with all of that there is no assurance of success. Let’s look at six other medium size cities in northern California and southern Oregon to see what their commercial air service consists of. Bear in mind that each city is its own unique market – just because City A has XYZ Airlines doesn’t mean that City B should, too – but it’s useful to be aware of what else is around us. At the end of the post are links to Wikipedia articles about each airport. Presently Redding has exactly the same SlyWest/United Express service that Chico does: Three flights each direction to San Francisco on the same Embraer turboprops that serve Chico. During the summer, (6 June-26 August) Redding will enjoy a fourth round-trip to San Francisco and then it’s back to three daily flights. Up until two years ago, Redding had two carriers. Horizon Air, the regional subsidiary of Alaska Airlines served Redding for many years from Portland, using 76 passenger Bombardier Q400 turboprops. In 2005, Horizon added southbound nonstop service to Los Angeles (LAX) which was well-received initially. (The service was in conjunction with L.A. service from Eureka.) But after a change in strategy that eliminated Horizon flights to several cities, all service to Redding was dropped in April 2011, and Redding has found itself a one-airline town ever since. Rod Dinger, Redding’s long-time airport manager, is diligent in pursuing opportunities but Redding faces many of the same issues as Chico. One big advantage Redding has that Chico does not, is already having in place the security and waiting room facilities to handle larger aircraft. It’s an attractive airport – I used it some years when flying from Redding to Portland on Horizon Air. It even has Peter Chu’s Skyroom, a Chinese restaurant on the airport’s second floor. Like Redding, Eureka after the departure of Horizon Air in April 2011 found itself in the position of having just one commercial air carrier: SkyWest/United Express flying the Embraer turboprops. One significant advantage that Eureka has over Redding and Chico is its remoteness from major airports: a drive to either Sacramento or San Francisco is five hours. Eureka has service to three cities: San Francisco, Sacramento, and Crescent City. To San Francisco it currently has six round-trips daily, going up to seven in June. To Sacramento it has two round-trips daily. And to Crescent City it has one daily round-trip (one of the Sacramento flights either originates or terminates in Crescent City). Little Crescent City has three daily flights in and out. Two nonstops each direction to San Francisco, and a flight to or from Eureka that terminates/originates in Sacramento. Crescent City is an “Essential Air Service” (EAS) city, which means that it receives an annual subsidy from the U.S. Department of Transportation for commercial air service. As with Redding, when Eureka lost Horizon Air it lost both its nonstop flights to LAX as well as northbound service to the Pacific Northwest. The Horizon service to LAX was operated in round-robin fashion, meaning that flights might operate Eureka-Redding-LAX or LAX-Eureka-Redding. Not very long ago (2009-2010), Eureka did enjoy summer season eastbound service on regional jets operated by SkyWest under the Delta Connection brand to Delta’s big hub in Salt Lake City, but the service was not renewed after 2010. Like Chico, Redding, Eureka, and Crescent City, Klamath Falls is served only by SkyWest/United Express with Embraer turboprops. While they do have service to two destinations (Portland and San Francisco), only one one round-trip is operated per day to each city. To both cities flights leave in the morning, and then return fairly late at night. Horizon Air formerly served Klamath Falls with service to Portland, but left town in October 2008. SkyWest/United Express resumed service in the wake of Horizon’s departure after having previously served Klamath Falls in the 1990s. Klamath Falls is roughly the same distance from Medford that Chico is from Sacramento. While Medford doesn’t have the array of service that a big city like Sacramento does, it has the most extensive by far of the airports I’m including in this post. Medford’s good fortune is that it is a 5 hour drive to either Portland or Sacramento, too far to be practical to drive under most circumstances. It must draw on a significant population base, too, because the number of enplanements (number of passengers boarded) is third in Oregon after Portland and Eugene. Alaska Airlines (Horizon Air) operates five round-trips daily to Portland, two to Seattle, and one to Los Angeles (LAX). SkyWest/United Express operates 6 to 7 round-trips daily (depends on the season) to San Francisco. 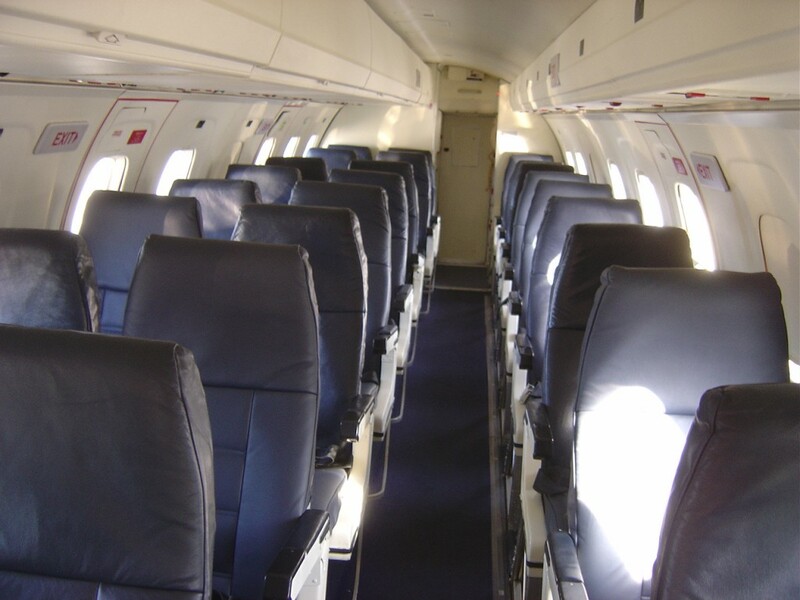 Most flights are Embraers, but one or two can be on regional jet aircraft. United Express also has two regional jet round-trips daily to United’s big Denver hub. Skywest/Delta Connection operates two round-trips daily on regional jets to Delta’s Salt Lake City hub. Allegiant Air, a leisure-travel only airline, operates twice weekly round-trip flights (Thursdays and Sundays) on MD-80 jets to Las Vegas, Los Angeles (LAX), and Phoenix-Mesa (AZA). Santa Rosa is an interesting case and one I’ll refer back to in future posts. It lost all air service in October 2001 when SkyWest/United Express dropped the city in the wake of the 9/11 terror attacks. 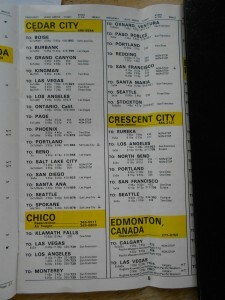 The service was a success from the beginning, with Portland and Las Vegas later added as destinations. Las Vegas service was dropped last June, but Alaska Airlines (Horizon Air) replaced the Las Vegas flights with service to San Diego. Santa Rosa is in the middle of a terminal expansion program and runway lengthening project at the conclusion of which they hope to be able to attract regional jet service to one or more of the western hubs of Salt Lake City (Delta), Denver (United or Frontier), or Phoenix (US Airways). One of my favorite details about Alaska Airlines/Horizon Air’s service is that they have a provision for Santa Rosa that allows passengers to check as baggage up to a case of wine at no charge. For the airport in the heart of California’s wine country this is a valuable perk to passengers and a marketing arrow in the quiver for both the airline and the airport. Alaska Airlines recently added this benefit to passengers flying out of Walla Walla (ALW), in the heart of one of Washington’s premier wine regions. Apart from the issue of reliability, another reason some people in Chico cite for not flying out of Chico is the higher price they think they will pay compared with Sacramento and other airports. Is that true? It depends. It depends on where you’re going. It depends on when you’re going. It depends on whether the people or computers that determine fares are paying attention to (or care about) comparable fares out of Sacramento. And sometimes it just doesn’t seem to depend on anything other than if the moon is full or whether your cat slept well the night before last. I’ve worked in the travel industry for most of my so-called adult life, and began on the airline side working initially in the TWA R.S.O. (“reservation sales office”, or “call center” in today’s parlance) in San Francisco in 1979. You may have read all or part of my lengthy blog series from a few years ago called “Airline Fare School” in which I teach the basics of airline fares to non-travel industry civilians. Though I’m still in travel, I do not sell airline tickets – I operate a hotel reservation service for business travelers who have more valuable things to do with their time than spend it fussing with hotel bookings. However through the Apollo travel industry system I use to confirm hotels, I have access to the airline side of the house, and I enjoy playing around with fares and flights, and price different scenarios. It’s my window on the glamorous airline industry. One thing that is essential to understand about airline fares is that they can and do change a lot. Competition, seasonality, systemwide strategic pricing changes, a bad hangover – lots of stuff enters into how an airline prices transportation. Anything you see in this post was true as of the moment I wrote it, but will no doubt go stale shortly thereafter. So take the spirit of it with you rather than the specific examples. I have obtained some great deals out of Chico. Three years ago I paid about $149 round-trip including taxes and fees to fly from Chico to Las Vegas. Now you’d be looking at around $400 to make the trip. By the same token when I was checking fares to LAX recently the best fare was $368 round-trip from Chico; the next day I saw fares of around $250 round-trip for a limited time period. That’s the way things are in this industry. 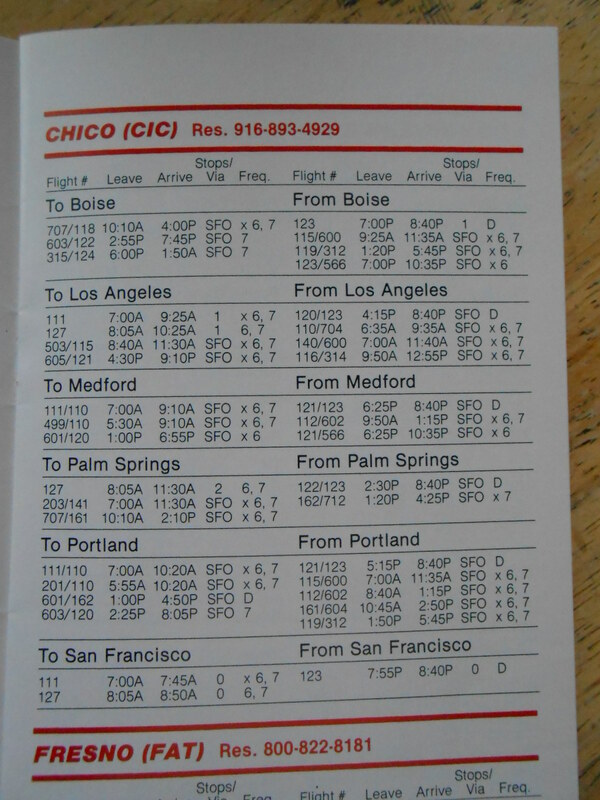 Over the years I’ve seen times when fares out of Chico were actually less than out of Sacramento. Why? Perhaps an automated system or the person responsible for updating fares was asleep at the wheel. Perhaps they were testing the Chico market. It’s impossible to say. At this moment I’d say there’s only one bargain price out there and it’s in the market probably the fewest people fly: simply between Chico and San Francisco and no further. (The vast majority of passengers connect in SFO to or from other cities.) United offers a round-trip requiring a 14-day advance purchase and Saturday night stay of $138. Note that this price (and others for domestic travel in the Lower 48) includes the 7.5% excise tax, but not various other fees (fuel surcharge, security, airport facility, flight segment). With all fees the $138 amount becomes $152. There’s no point in comparing prices from Sacramento to San Francisco since hardly anyone flies it for local traffic, and certainly no one from Chico would drive to Sacramento and then fly to San Francisco. Let’s now look at examples of other prices from Chico and Sacramento to popular destinations. – prices out of Chico can be less than what you see below when the fare is “broken” (ie. 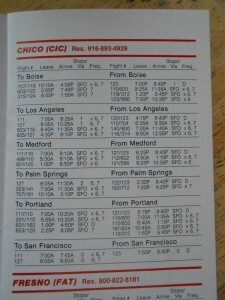 the system prices an itinerary using point-to-point fares such as Chico-San Francisco plus San Francisco-New York, instead of the thru fare between Chico-New York because the sum of the parts is lower). In a moment I’ll show you when flying out of Chico is almost a no-brainer: flying internationally. But let’s wrap up flying domestically. Again, I emphasize that this is a snapshot in time from when I wrote this post, and only touches on the lowest fares in a market. Fares with less or no advance purchase at all, commonly used by business travelers, are significantly higher from any airport. If you are deciding whether to fly out of Chico or Sacramento, you also need to weigh the additional costs that come with Sacramento. First you have the drive – 172 miles round-trip from my house – that includes a big, dreary, 2-lane highway/non-freeway chunk whether you take 70 (my route) or 99. (It’s 12 miles round-trip from my house to the Chico airport.) Do the math yourself for the fuel cost considering the mileage your vehicle gets. Secondly, you have parking in Sacramento, the least expensive of which is $10 per day. 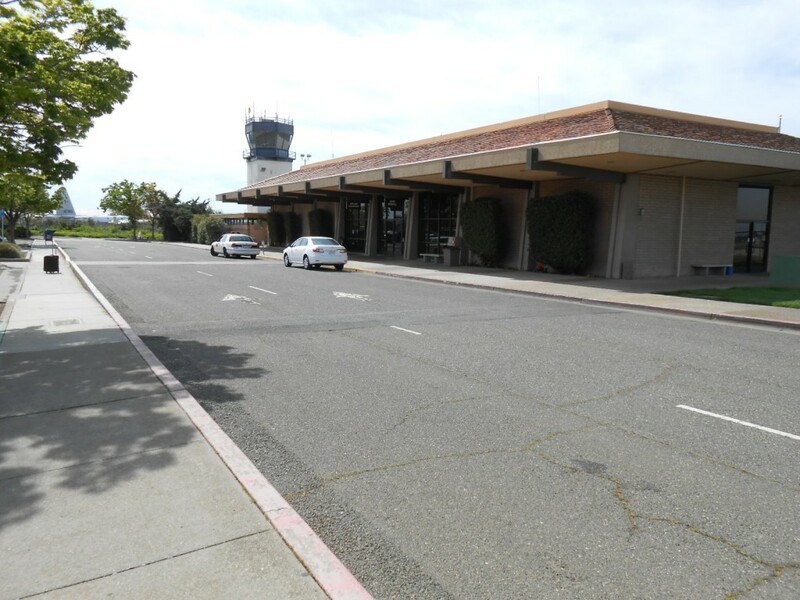 Parking at the Chico airport is currently free. While the City is considering imposing parking fees, my hunch is that this will not occur for some time. Lastly, consider the additional time required to use Sacramento from two different perspectives. Besides the long drive, it simply takes longer to get around the Sacramento airport and to your flight. In Chico, well it’s sort of like boarding the aircraft from your living room. 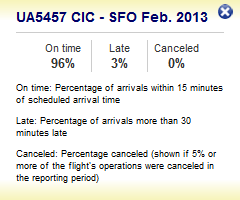 And the other time factor is the nature of flights available from Sacramento vs. from San Francisco. Sacramento is simply not a Big League airport in the same way that San Francisco is. That means, in order to get to many important destinations from Sacramento you have no choice but to use connecting flights. A nonstop from San Francisco to Boston gets there a lot faster (and more reliably) than a connecting flight from Sacramento via Chicago (or Atlanta, Dallas, Denver, Phoenix, Las Vegas, etc). None of this is meant to say you shouldn’t fly out of Sacramento. It’s your choice, and on many occasions it might make better sense from one or more standpoints. But compare all of the elements of the trip, not just the ticket price alone, before you write off Chico. If you are being taken to (or picked up in) Sacramento you may also find it handy to fly out of Chico but back to Sacramento, or vice-versa. Now let’s look at some examples to illustrate that you really must consider Chico when you’re flying outside of the United States. I don’t think most people from Chico fly out of Sacramento for international travel – they drive and leave their car at San Francisco. But in so many instances, United common-rates fares (applies the same price) out of Chico and San Francisco so that for all intents and purposes you fly for free between Chico and San Francisco to connect with international flights. These examples are using the same flights from/to San Francisco, with the Chico flights added at either end. Because there are fuel surcharges and lots of taxes and fees for international travel, I’m providing the total price for an apples-to-apples comparison. When higher from Chico, the amount is small, and usually due to the application of fees or taxes. Look closely at the difference – sometimes it’s actually less to fly out of Chico! If you have a fear of missing your connection out of San Francisco on an international flight you can book a really long connecting time – up to 24 hours – without paying extra. I wrote about this in Airline Fare School. For all international destinations except Canada, the connecting time in domestic airports may be up to 24 hours without causing a break in fare (i.e. paying more). Is it in general more expensive to fly out of Chico for domestic travel? Yes, but not always, or at least not always by an exorbitant amount. I suggest that Chicoans check rates from both Chico and Sacramento, and then weigh the factors of cost, convenience, and reliability, and choose accordingly. Could prices be more attractive? Yes, in particular to other cities in California, adjoining states and elsewhere in the western United States. Perhaps this is by design to encourage passengers to mostly use flights from Chico to San Francisco to connect with long-haul United flights, but since so much air travel is regional it may dampen potential demand. Knowing who at United sets prices, and what criteria they apply (and what grounds for flexibility they have) would be very useful in efforts to make flying from Chico more attractive. I’m not pretending to present an authoritative history of Chico’s air service, but rather just a couple of snapshots of old airline timetables I own. Links embedded in the names of airlines referenced go to Wikipedia articles. 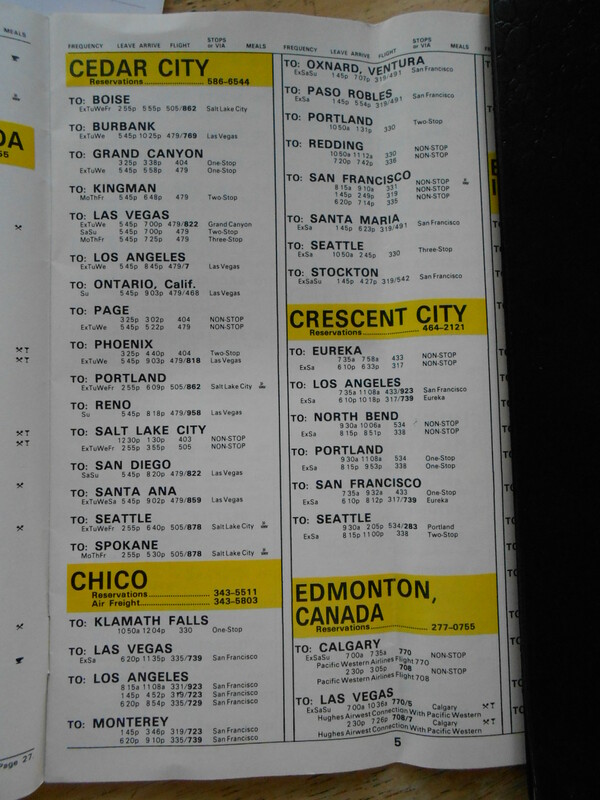 This Hughes Airwest timetable from 1973 listed three daily flights to San Francisco and two to Redding. One of the Redding flights was a milk run that continued to Klamath Falls, Portland, and Seattle. 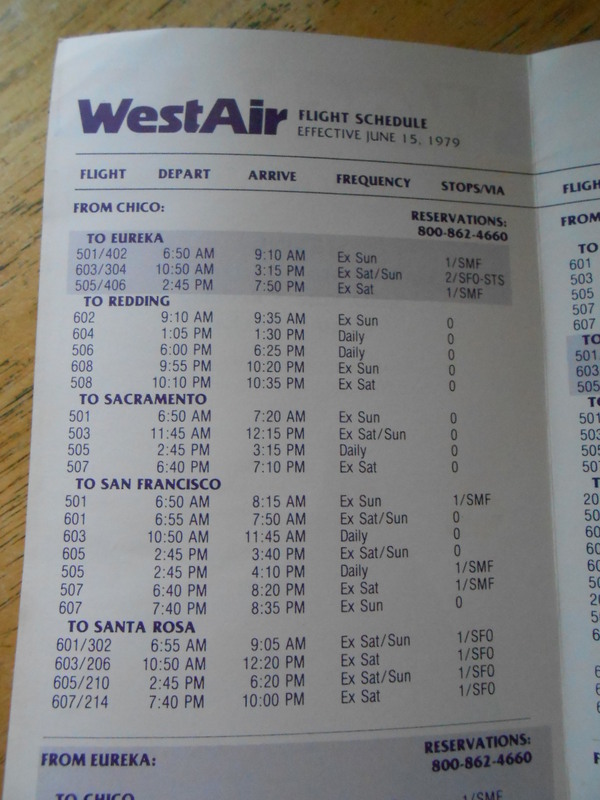 WestAir operated nonstop flights to Redding, Sacramento, and San Francisco. Pacific Express was noteworthy not only because it flew jets (BAC 111) but also in that it was actually based in Chico, though Chico flights were an insignificant part of its network. 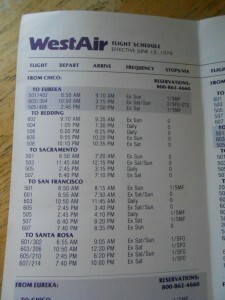 In this timetable one daily round-trip operates to San Francisco. (The southbound flight continued to LAX.) Pacific Express operated between 1982 and 1984. I moved to Chico in September 1998, and between that time and late 2000 I traveled to and from Washington, DC, frequently. At that time (and for how long before I do not know) SkyWest/United Express was the sole carrier to Chico, and exclusively to and from United’s San Francisco hub. During the 1998-2000 period in which flew I frequently, United Express operated six flights each direction. In the autumn of 2012, service was reduced from four to three flights where it stands now (April 2013). When running an errand on my bike downtown yesterday, I noticed that the space under construction at 325 Broadway had a business sign above the door: Wanderful. Some of the biggest companies in American newspaper media (including MediaNews Group, parent company of the Enterprise-Record) are among the financial backers. Interesting. What I was also unaware of until now is that Wanderful was already in Chico out at the airport, but they plan to relocate downtown soon. In doing so they will keep company with some of our other local tech outfits including Auctiva and EXL Landa (formerly Landacorp) just a few blocks away. Wanderful was referenced briefly in an article from 15 February in the E-R.
Should we be calling Chico the “Silicon Orchard” now? The Chico location is Wanderful’s development and operations center, and I’m delighted to say that the headquarters is in my hometown of Los Gatos in the Santa Clara Valley. (I never call it Silicon Valley. Santa Clara Valley sounds so much better.) In case you don’t know, a very well-known company also calls Los Gatos home: Netflix. A warm “walcome” to Wanderful! 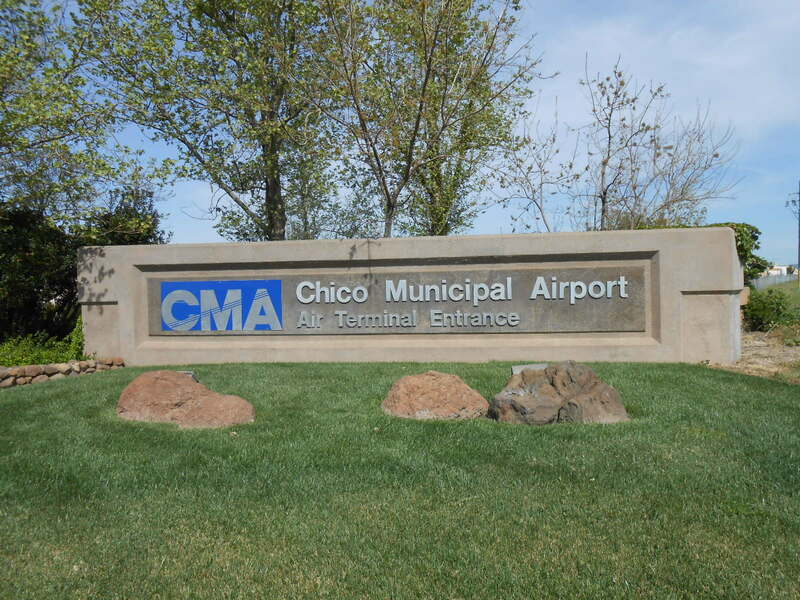 The City of Chico Airport Commission will hold a special meeting on Tuesday, 12 March, at 6:00 p.m. In conjunction with City staff, the commission is to draw up a work plan (which must be approved by the City Council) that sets priorities and guides the commission for the next two years. If you’re interested in matters that the Airport Commission oversees (attracting additional commercial air service, setting fees for airport services, economic development around the airport) then you may be interested in attending this meeting. Normal Airport Commission meetings are held quarterly with the next regularly scheduled meeting set for 30 April. Note that the location of the special meeting is not the City Council chambers, but rather next door on the second floor of the Old Municipal Building at the corner of 5th and Main.